If Happy Clapper doesn’t earn a slot in The Everest, the popular galloper and reigning Doncaster winner won’t race in Sydney this spring. 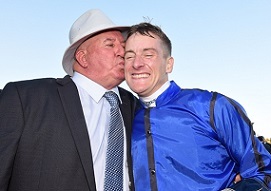 Trainer Pat Webster and jockey Blake Shinn celebrate a Doncaster win with Happy Clapper. (Pic: Steve Hart). Trainer Pat Webster says he isn’t losing any sleep over whether or not the rising eight-year-old is selected by one of the remaining seven slot holders for the $13 million feature at Royal Randwick on October 13 and already has a couple of plans in place. Happy Clapper, a winner of three Group 1s in the 2017-18 season, is about three weeks away from his first trial. Webster said he’s been leaving any dealings to do with The Everest to owner Michael Thomas but hinted he’d prefer to know sooner rather than later. “I told him unless he has anything definite not to worry me,’’ Webster said. “We talk regularly but he hasn’t mentioned it so I presume nothing is in concrete. I’m too old to be worrying about things I have no control over. “The owner might say he’d have to think about it too because there are other options. There were early reports of interest in Happy Clapper from the Australian Turf Club, which is unlikely to make any decisions in the short term, and The Star who has already elected to lock in Shoals. With Royal Ascot completed and the likes of Harry Angel injured, the defeats of Lady Aurelia, Battaash and Redkirk Warrior and Merchant Navy heading to stud interest will surely swing back to local horses. Happy Clapper is in his fourth week of work this preparation and Webster said at this stage he will tackle the Group 1 Memsie Stakes (1400m) at Caulfield first-up on September 1. Webster said the gelding has come back stronger, weighing in at 575kg, and if an Everest slot does come up he’d tread a bit of water with the aim of tackling the race fresh where he’s certain he’d be competitive. “He doesn’t know how not to be in the finish at Randwick,’’ he said. The gelding posted first-up wins at Randwick in the spring and autumn this season including a track record breaking performance fresh in the autumn in the Group 1 Canterbury Stakes over the 1300m. He chased home Winx in the George Ryder then finally claimed a Doncaster Mile at his third attempt, easily accounting for subsequent Group 1 winner Comin’ Through and completed the rare Epsom-Doncaster double in the same season. His preparation ended with another placing behind Winx in the Queen Elizabeth Stakes (2000m). “The Doncaster was everything for the owner and everything for me. We’re just playing it by ear, he had to come back in anyway,’’ Webster said. Everest slots confirmed so far are Trapeze Artist (Aquis), In Her Time (TAB), Redzel (Yulong Investments), Brave Smash (Chris Waller Racing) and Shoals (The Star). Happy Clapper is a $15 chance in TAB’s All-in market with Trapeze Artist the $4.50 favourite.